SEPTEMBER 14th, 2016 – TAMPA, FL – Set It Off has announced a special album release event that is set to take place on Tuesday, October 4th at Full Sail Live, the state-of-the-art performance venue on the campus of Full Sail University in Winter Park, FL. The event, presented by Full Sail University and sponsored by Monster Energy, will include a full band live performance, a Q&A session (moderated by the 2016 Vans Warped Tour Monster Energy Pit Reporter, Tori Kravitz), and an exclusive meet and greet with fans. The event will also be the only place to get the album early, ahead of its official release date. It will take place from 6pm – 9pm, with the live performance portion of the evening beginning at 7pm EST and made available via streaming live online here. A limited number of free tickets to the album release event will be made available to the public. Seating is limited, and will be available on a first come, first served basis. If you are in the Central FL area and are interested in learning how to attend the event in person, visit http://setitoffband.com/upsidedown/ to register for your free ticket. Upside Down is set to release on October 7th, 2016 through Equal Vision Records. The album was recorded in Los Angeles, CA with producers Brandon Paddock (Panic! At The Disco, Avril Lavigne, Pentatonix), Erik Ron (Saosin, Panic! At The Disco) and Mike Green (5 Seconds of Summer, All Time Low, Cassadee Pope). It was chosen as one of the “Most Anticipated Albums of 2016” by Alternative Press Magazine and is now available for pre-order by visiting http://setitoffband.com/. 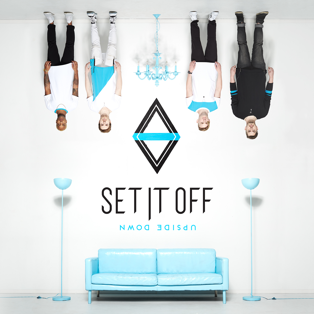 Set It Off recently released a lyric video for “Life Afraid” on Vevo or YouTube. The band previously released the song and music video for “Something New” which was co-written with Alex Gaskarth of All Time Low. Watch the music video for “Something New”here. Upside Down will receive “Life Afraid”, “Something New” and “Uncontainable” as instant grat tracks.